The UC Santa Cruz Arboretum will hold its annual Fall Plant Sale on Saturday, Oct. 15, from 12 noon to 4 p.m. at the Arboretum's Eucalyptus Grove on High Street near the intersection with Western Drive. The Arboretum plant sales are wonderful opportunities to take home some of the dazzling year-round color of the UCSC Arboretum. Whether California natives or plants from Australia, New Zealand, or South Africa, they happily grow side-by-side in the Central Coast's Mediterranean climate. Hundreds of varieties of spectacular and unique plants are carefully chosen and propagated to conserve California native plants and other beauties bred for drought tolerance and pest control. The fall is the best time to get new plantings established in the garden. Knowledgeable Arboretum staff and volunteers are on hand to provide expert gardening advice and plant information and to answer questions. 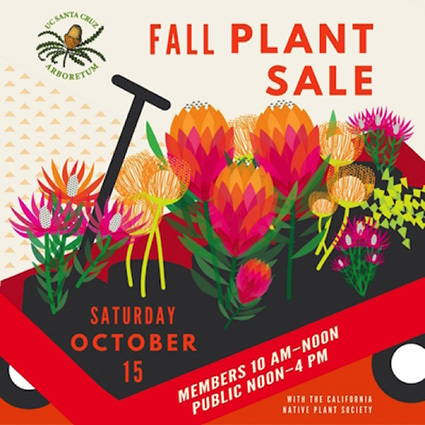 As in previous years, the Arboretum's plant sale is a joint event with the California Native Plant Society (CNPS), offering high-quality, regionally-friendly plants from both groups at great prices and supporting valuable environmental education and conservation efforts. For Arboretum and CNPS members only, the sale opens at 10 a.m. on Saturday, Oct. 15. The public sale starts at noon. Memberships can be purchased online before the sale or at the gate on the day of the sale. The UC Santa Cruz Arboretum is a 50-year-old treasure and beloved destination for the Central Coast and local community.